The UK's leading blended learning provider for health and social care, with over 200, 000 users. 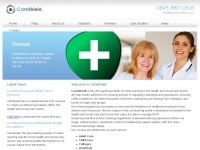 three profiles were found for Careshield.co.uk in social networks. Among other social networks the website is represented in Facebook, Twitter and LinkedIn. The web server used by Careshield.co.uk is located near the city of Dublin, Ireland and is run by Amazon.com. There are many websites run by this web server. The operator uses this server for many hosting clients. In total there are at least 420 websites on this server. The language of these websites is mostly english.